We had that information published, but it wasn’t obvious. Let’s try to make it more obvious now. We also highlight the sponsor’s name so it is quite impossible to miss it. The purpose is to make it easier for you to know who is your sponsor. How Can I Learn More About My Sponsor Or Uplines? 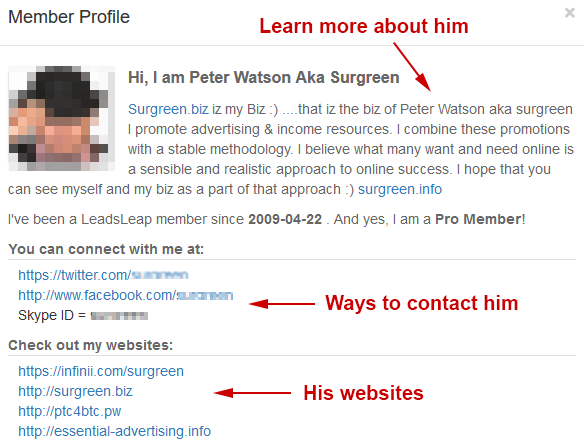 To learn more about any upline, just click on the name or image (if available) to show his/her profile. If the member has set up his profile completely, you will be able to learn more about him, his website and ways to connect with him. If you are curious about who is your sponsor, or you want to contact the person for assistance, this is how you can reach out to him/her. Of course, if the uplines prefer to stay anonymous, they can leave the profile blank. In that case, since they prefer not to be contacted, we should respect that. The system will show that there is no message from your sponsor. The message will appear at the end of the Upline Messages. Nevertheless, you can still click his name and see his profile. What If A Sponsor Has Left The System? If your sponsor has terminated his/her account, then you will not see any sponsor info. What Should I Do To Take Advantage Of These Changes? 1) Make sure that you’ve set up your Downline Message and update it at least every 6 months (not that hard right?). 2) Set up your Member’s Profile so that other members can learn more about you. Your Member’s Profile is not only viewable by your downlines. It is also viewable by other members who click the image on your ad. Great way to keep in touch with the upline. Just came to know of it now. Thanks Kenneth for your hard job, you really take improvement in my knowledge. Nice step-by-step guide, thanks a lot! There are varieties in your article always. It is interesting and amazing. Keep posting like this. Nice article written by you. Very useful information. Nice post, very useful information.